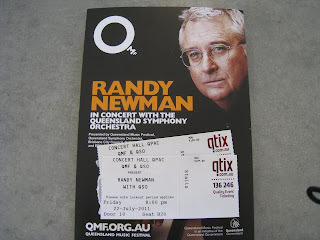 I must have gone awfully close to missing Randy Newman with the Queensland Symphony Orchestra at the QPAC Concert Hall after I misjudged the amount of footpath on the other side of a lamp post and found myself tumbling onto Grey Street in the face of serious oncoming traffic. Actually, I must have gone awfully close to serious hospitalisation but nothing short of serious injury was going to stop me from actually getting there, so it was a case of a quick return to the hotel room, an improvised patching up that used up most of Madam's supply of bandaids and a change of pants before resuming the quest for pre-concert nourishment. Whether the delay kept us out of the preferred option will never be known. The tapas bar that was the preferred option was, as it turned out, a case of needing a reservation by the time we arrived on the doorstep and everywhere else in the vicinity looked reasonably close to chockers. We settled for a very basic toasted sandwich and a couple of glasses of water at the cafe in the courtyard rather than the tapas and interesting wine we'd pencilled in earlier in the day. Still, with the prospect of Randy Newman in an orchestral setting I'd have happily settled for a slice of dry bread and a cup of warm dripping if it was going to ensure entry in a situation where the tickets advised us to Please note lockout period applies. In hindsight we could have gone for something a bit flasher in the dinner department, since we were in the environs of the Concert Hall well before the doors opened. With the possibility of backstage access after the show I wanted something other than a ticket to get signed, and in the absence of anything resembling a program I shelled out for a copy of 12 Songs, the only Randy album I didn't have on CD or as a download from iTunes. Actually, I would have had it as a download but bucked at the prospect of paying $16.99 for just under thirty minutes of music, which I thought was over the odds. So I spent $25 for the CD instead. The visit to the merch booth gave me the first inkling that we were in for an interesting audience as a woman who obviously knew nothing about Randy Newman but was intent on buying something agonised over the choice between 12 Songs and the two volumes of The Randy Newman Songbook. I politely pointed her towards Songbook, and pressed for a choice between the two suggested Volume 1, but indicated that there wasn't much in it, so the best option was to buy both. From there we wandered around, moving gradually towards Door 10, spotting Paul Kelly in the bar on the way. The concert was part of the 2011 Queensland Music Festival, so you'd probably guess Festival Director Deborah Conway and a couple of other notable figures were also in the vicinity, but if they were we didn't notice. Given the demographic we're looking at where long term Newman fans are concerned there was no obvious way to distinguish between those who were there for Randy Newman and those who were there because of the Queensland Symphony Orchestra. There were probably a fair sprinkling of people who were only there because they'd scored free tickets, or because they'd been given tickets as a Christmas or birthday present. Those last two categories covered the couple on my left (freebies) and in front of me (present) who knew each other, so the pre-concert conversation among four people who knew nothing outside Short People meant reactions were going to be interesting once things got underway. Lack of a program at the merch booth was negated by one on the seat when we arrived, though, significantly, Mr & Mrs Freebie next door didn't seem to have been allocated copies. Either that or they'd quietly pushed them aside, failing to consult them. Interesting. In any case, the program contained a setlist, rendering the notebook in the pocket surplus to requirements, and a glance at what was scheduled revealed most of the most obvious candidates for inclusion, though there were some fairly obvious omissions, two of which, of course, turned up in the encores. From the opening Birmingham through to the final I Think It's Going To Rain Today we got a setlist that would have satisfied most Randy aficionados once you'd taken the inherent limitations of the show into account. For a start, if you've got access to a full symphony orchestra you're going to use them, so eight solo numbers out of twenty-four seems like a pretty fair ration. Following Birmingham with a solo Short People was a nifty way of getting the most obvious suspect out of the way early in the piece, and the introduction to Girls In My Life should've convinced the classical types in the audience that they weren't getting just another hack writer of pop songs. Long time fans, of course, are only too aware that Newman could probably do a reasonable line in theatrical comedy, and the explanation of the song's origin that preceded The World Isn't Fair reinforced that impression, as did the intro to I Miss You (I wrote this for my first wife while married to my second). If there was going to be a departure from the printed setlist it could only come in one of the solo slots, so while the program said Kingfish slotting in Mama Told Me Not To Come before Love Story, Marie and You Can Leave Your Hat On delivered a rather nifty overview of early Randy before the audience participation on I'm Dead (But I Don't Know It). 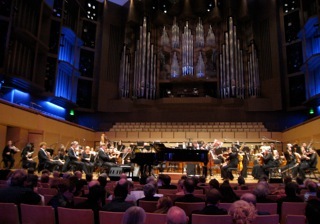 A glance at the lyrics of I'm Dead leaves a fair indication it's aimed firmly at those survivors of the seventies who are still going through the motions, delivering the same old schtick but Randy's introduction pulled no punches before he coached the audience through our role, one which we (and the members of the orchestra) allegedly enjoyed too much in the delivery. The Great Nations of Europe was suitably stirring, and while I wasn't familiar with I Love To See You Smile (subsequent research reveals it's from the soundtrack to Parenthood and apparently unavailable in any legitimate way shape or form, so that's hardly surprising) I wasn't upset by the inclusion. Yes, I know it kept something else out of the setlist, but it was a fairly natural lead into the instrumental suites from Toy Story and The Natural, which had conductor Guy Noble skipping off stage, leaving Newman the baton. Not being a movie person I wasn't familiar with most of what followed before and after the half-way break, having seen Toy Story with a major hangover one breaking up day and having missed The Natural, Maverick and Avalon. I'm not overly familiar with the likes of Aaron Copland either, so while he's one reference point quoted for Randy's soundtrack work I can't comment. What was obvious over the twenty-plus minutes was that Newman knows his way around a conductor's baton (hardly surprising since he's conducted the orchestral segments of his soundtrack work) and the four suites worked pretty well by themselves without accompanying visuals or the oh yeah, that's from the bit where familiarity with the movies involved. Comments from my left at the end of the interval revealed Newman newcomers who'd been highly impressed, and with the Maverick and Avalon Suites out of the way, it was back to solo mode for It's Money That I Love before things were slowed down for In Germany Before The War and Cowboy with the Orchestra adding light and shade. Dixie Flyer kicked things up a notch, Better Off Dead dropped it back slightly, and You've Got A Friend In Me was preceded by an apology for leaving it so late and a suggestion that kids in the audience could be woken up. The main set concluded with a magnificent Sail Away, Emotional Girl, a Political Science that produced the predictable reaction to we'll save Australia and a Louisiana that would've resounded rather deeply with many in the audience after the floods earlier in the year. It brought me to the verge of tears, anyway. The absence of obvious suspects Lonely At The Top and I Think It's Going To Rain Today from the program was explained when they appeared as the encores, and while I suspect the crowd would have happily gone on clamouring for more Rain was preceded by a definite ruling that there'd be no more. Madam sighted the First Aid station on the way out, and we managed to get the injuries from the fall earlier in the evening patched, a process that lasted long enough for most of the crowd to disperse so there was no chance to gauge the audience response around the merchandise booth (I didn't get that far during the interval either) and we made our way downstairs in search of the Stage Door where we found our names on the list for backstage access. Having received a couple of passes we settled down to wait, passing some of the time in conversation with a couple from the Sunshine Coast and their daughter who were waiting on the off-chance of an Anthony Warlow autograph. As it turned out everyone ended up disappointed. Warlow, Randy and any other backstage dignitaries all managed to escape through an alternate egress, something that was understandable given a bloke who's sneaking up on seventy, had delivered a good two-and-a-bit hour show, had spent two days in rehearsal and was probably coming off jet lag as well. Madam suspected that there was a touch of something else in there as well as he seemed to struggle a little when it came to hitting the high notes.